By whipping up a savory mixture of panko seasoned and sautéed with sun-dried tomatoes, olives, garlic and basil, I turned a simple dish of grilled vegetables into something more substantial. I selected eggplant and zucchini, but mix and match vegetables according to what is appealing to you. Bear in mind that the topping is crumbly, so a flat base on the vegetable for the topping is preferred, such as grilled peppers, tomato and onion slices. Here are some other delicious ways I’ve given vegetables star-status on the grill. Over medium heat, heat oil in a medium-sized sauté pan. Add garlic and red pepper flakes and cook 2 minutes or until just fragrant. Stir in panko, sun-dried tomatoes and olives. Allow to cool then stir in Asiago and basil. Reserve. Preheat gas or charcoal heat to medium. 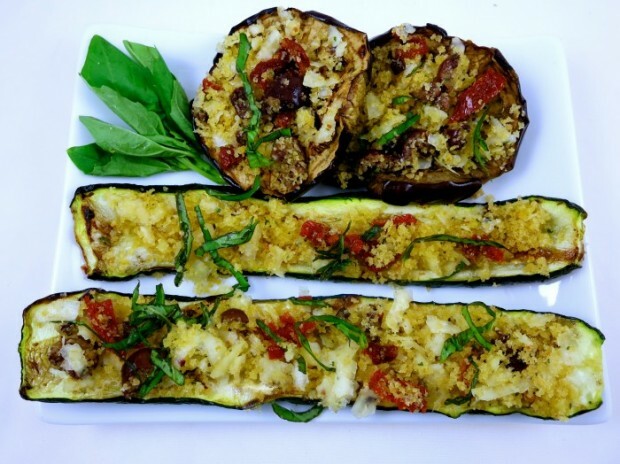 Brush cut sides of eggplant and zucchini with olive oil and grill until lightly browned and tender, about 10-15 minutes per side. Place on individual plates and spoon panko mixture over vegetables. Serve. More Recipes Filed Under "Vegetarian"